For rock, country or blues players who want a moderately powered amp they can crank up on a small to medium sized gig or in the studio, the Trinity Amps Tweed may be the amp for you. The fat, snappy guitar tones heard on many recordings, from Memphis to Abbey Road, were made using the Tweed. This is not a Marshall Les Paul EL84 sound, but it is familiar if you’ve heard anything recorded in the 60’s or 70’s. 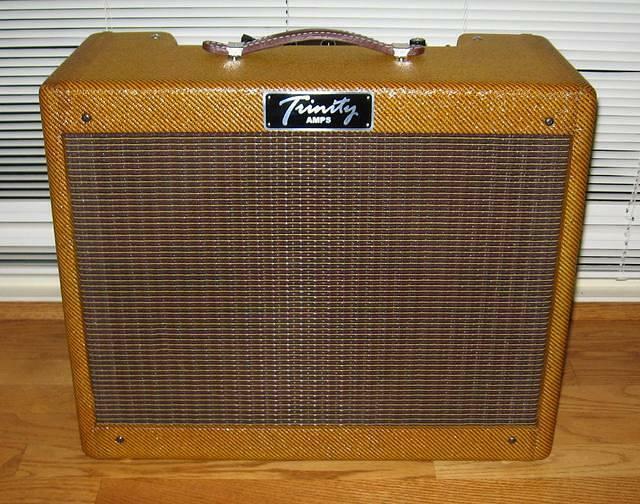 The Tweed produces about 15 loud watts into 8 Ohms using two 6V6 output tubes and is housed in a classic Tweed cabinet. The circuit is based on the original Fender 5E3 Tweed Deluxe. You can use this amp with almost every style of pickup or guitar including Tele’s, Strat’s, Les Paul, Gibson SG, Esprit, 339, Gretsch etc. The Tweed can get tones ranging from some of the best fender clean tone you’ve ever heard, to that cool jazz and blues midrange focussed tone, all the way to some very, very meaty rock distortion (picture Black Crowes). For an amp with limited controls it can get an amazing array of tones. Distortion comes on fairly quickly but it is warm and subtle and not grainy. This tone is perfect for jazz soloing. When a bridge pickup is used, there is a lovely grind that is smooth but with bite. Plug into channel 2. Set channel 1 volume at 6, channel 2 volume at 3, tone at 11ish, guitar tone about 3/4 then vary the guitar volume : 1/2 for clean, 3/4 for a bit of edge. You can get delicious grind with this simple setup simply by controlling the overdrive with the guitar volume knob. What amazes players who own, record or audition this amp, is the ability to pull tones from any era. Classic rock and country are a given, but also Van Halen style shred, Edge/U2 atmospherics, and brutal, grinding techno/industrial. The Tweed also takes pedals beautifully, and is a good base layer for plugins. True to the Fender original, the Tweed has 2 channels, 2 inputs per channel, each with a volume control and one shared tone control . 3 knobs in all. But the interaction between the controls makes it much more sophisticated than one would expect. Even though the features are limited, it is one of the most versatile amps ever. Jazz, blues, rock, country, it’s all there. It has enough power for most jams and small gigs. With a Tone Tubby Alnico, it is loud with a fabulous tone. To develop and refine the Tweed, we improved the layout, grounding, isolated the input jacks and reduced noise level. We then had Heyboer develop custom transformers to our spec. The Power Transformer is improved with high current capacity and a ground wire for the heaters to minimize hum. The OT is the more expensive Fender #108 design and we used old grade steel laminations and paper bobbins to our spec. The redesign also includes a standby switch. Included is a custom Tweed styled cabinet with your choice of Vintage lacquer finish or unfinished Tweed. Leather Fender style strap Handle with chrome fittings and glider feet. Our Tweed is built with quality parts – Switchcraft Jacks, Carling Switches, Belton tube sockets, Carbon Composition resistors, Orange drop capacitors and thick board material. The chrome chassis with white silk-screened lettering looks stock from the outside, it’s built old school and sounds and looks vintage Tweed Deluxe!